Floating is essentially an amped up Epsom salt bath. An at-home version won’t have the same sensory vibe as going to a Float center. But proponents of Epsom soaks cite the same benefits* that you’ll find enumerated by Float centers, though perhaps to a lesser extent. Many people are low in magnesium and absorption through skin is supposed to be one of the most effective methods to up your levels. My personal experience has been reduced soreness, faster healing, better sleep, and detoxing. As a benefit, at-home soaks also don’t require advanced booking – if you have some free time on a random evening, you can run the water and hop in. You can pick up a couple of pounds of Epsom salts at pretty much any grocery store or pharmacy, usually in the first aid section. Some even have essential oils or clay add-ins that are supposed offer added benefits. I keep it simple and stick to the plain stuff. Run the bath close to bedtime. Especially if you’re doing this for the first time, are coming down with/fighting off an illness, and/or are expecting some detox. You’re likely to feel tired and/or content afterwards and not be up for doing much. Run the water hot enough that you question whether you’ll be able to get in. I happen to like really hot baths so this is a bonus for me. While the tub fills, add 1-2 cups of Epsom salts. Sometimes I use 3 when I know my system is running well below its peak performance. Put your smartphone (safely) nearby playing some tunes that you find relaxing. Make yourself a goal of how many songs you’re going to soak for – this is how I keep from jumping out after 5 minutes because I’m “bored.” The average radio hit is 3 minutes long, I usually aim for at least 4 songs. Get in and find your first comfortable position. As a tall person, I know many of us have to play the “nips or knees” game when it comes to what is underwater. I’m lucky enough to have an extra-deep tub at my rental so if I put my knees to one side while keeping my head and shoulders point at the ceiling, I can *almost* get everything under. The good news is that the bath is so hot that your whole body will be warm, regardless of which parts are poking out of the water. Try to relax into it. Enjoy the music (only skip a song if absolutely necessary) and find your next comfortable position. And the next position. And the next. When I’m sweating and my stomach starts gurgling, that’s how I know it’s working. Force yourself to stay seated when you pull the plug just as the 4th song ends. Stand up only when the water is almost gone and turn on the shower to rinse off. Wrap yourself in a towel or two and prepare for a great night’s sleep. Repeat as often as you’d like. 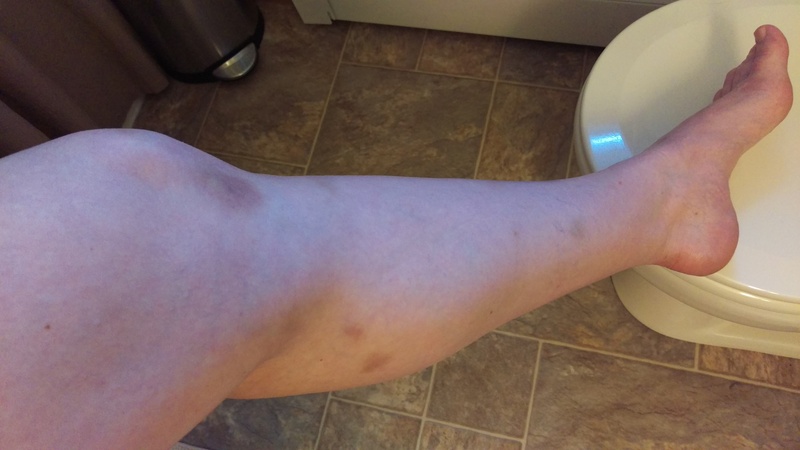 Last year when I first started BJJ and had an endless supply of bruises and sore muscles, I averaged 1-3 soaks a week. I used them for recovery after my broken leg as well. Lately, I’ve only been soaking a couple of times a month on average. I’ll be aiming for closer to weekly as my training time increases. If you’ve been able to go to a float center, I’d love to hear about your experience. A gift “float” was top on my list of Xmas wish list. Between my insane schedule and floating’s popularity, I only *just* booked my soak for the end of this month. I’m psyched to see what it’s like to take my soak to the next level! *In doing some quick research for this article, I found mixed opinions about the effectiveness of Magnesium absorption through the skin and effects of soaking. Understand that all items in this article are “true in my experience.” Also, I’ve seen through a reliable scientific source that Epsom salts can act as an anti-fungal and help with ringworm – BJJ hazard bonus!